This patient was diagnosed with necrotizing pneumonia. 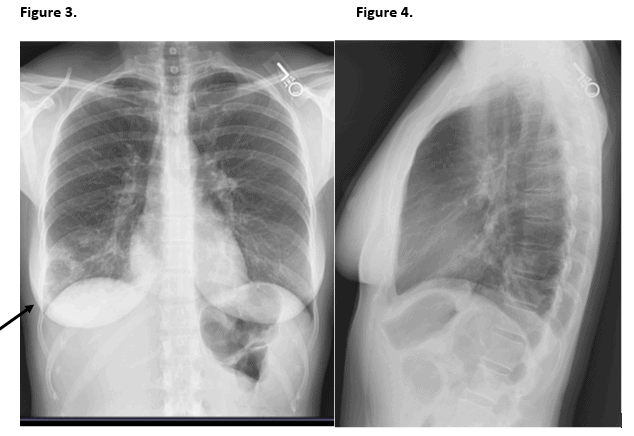 Examination of the images shows the cardiomediastinal silhouette is within normal limits. Patchy infiltrate is noted in the right lower lobe, concerning for pneumonia. This infiltrate demonstrates a focal area of low density in its lateral inferior aspect, concerning for possible area of either incomplete consolidation or cavitation. An area of cavitation would be concerning for necrotizing pneumonia. No pleural effusions are seen. There is no evidence of pneumothorax. The soft tissue and osseous structures appear unremarkable. Acknowledgement: Images and case provided by Teleradiology Specialists, www.teleradiologyspecialists.com.